A student’s decision of where to attend college is the biggest decision they will make at that point in their lives. Since this decision will affect the student both socially and financially, higher education institutions have to create content that answers a myriad of concerns. Once a university has made a student aware, it has to make both emotional and rational appeals. This broad spectrum of information comprises the Content Marketing Matrix, and higher education institutions have to master it to turn a prospective applicant into a student. 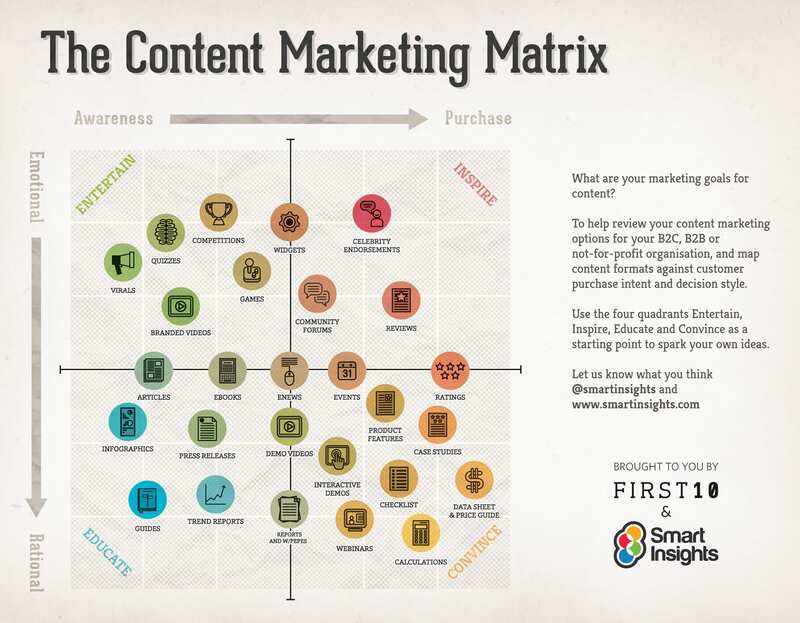 The Content Marketing Matrix is composed of two axes, one moving from emotional to rational, and the other moving from entertaining to inspiring. Fun, highly shareable pieces like quizzes or listicles sit in the emotional and awareness-raising quadrant, while financial information, with their rational focus, convince students to purchase. Each quadrant is defined differently, and universities will have to appeal to each section. College life is a profoundly social experience, so it pays to give students something worth sharing. Quizzes, competitions, and viral content dominate this section. A Uversity study on the internet usage of students reports that while Facebook still dominates the social media world, It is steadily losing ground to upstarts like Instagram and Twitter. The rise of image-heavy social media channels like Instagram, Tumblr, and Pinterest is because younger social media users want to be entertained with visual content. In short, they’re looking to share the sort of fun content from this category. To make content more convincing, there’s no substitute for social proof. Like a movie everyone’s talking about or a destination everyone swears by, crowdsourced wisdom will get a prospective applicant to make a commitment. Though entertainment and inspiration are crucial, a student isn’t just need a university to address her emotional questions. For parent’s, their child’s decision about where to apply is the biggest financial commitment they have made in their lives. University press releases and guides frame the decision in the best way possible, and are the first step to creating a narrative for prospective students. Infographics are an especially engaging and memorable way to impart information. A 2012 study found that between 2010 and 2012, the popularity of infographics shot up by 800%, and it’s easy to see why. An infographic is both visually appealing and easy to follow—they walk people through information in a way that is entertaining. Image-based sites like Pinterest are full of great infographic, combining the best aspects of raising awareness and imparting rational data. Ultimately, the Uversity study found that the most searched-for information by university applicants was about scholarships and tuition. The convince quadrant, with its data sheets, pricing guides, demos, and calculations, is where a student will make the crucial decision of where to attend. A university should showcase case studies, because they personalize this information. Narrativizing this information through a case study both demystifies the process and allows the student to imagine themselves going through the process. When they understand exactly how they move through the process themselves, they’re ready to decide.